The 2005 Ballon d’Or winner is currently playing in exhibition matches across the globe, with his latest one coming in Costa Rica. The former Brazil international was playing as part of an invitational XI against Costa Rica legends in a match at the Nacional Stadium in San Jose. A few days ago the 37-year-old responded to questions of his retirement by saying: “If there’s a team that would want me without the training, it’s still possible to play” – just about the most Ronaldinho answer he could have given. During the Costa Rican legends match, a pitch invader took to the pitch in search of his idol, but couldn’t find the Blaugrana legend and was slowly escorted off the pitch. 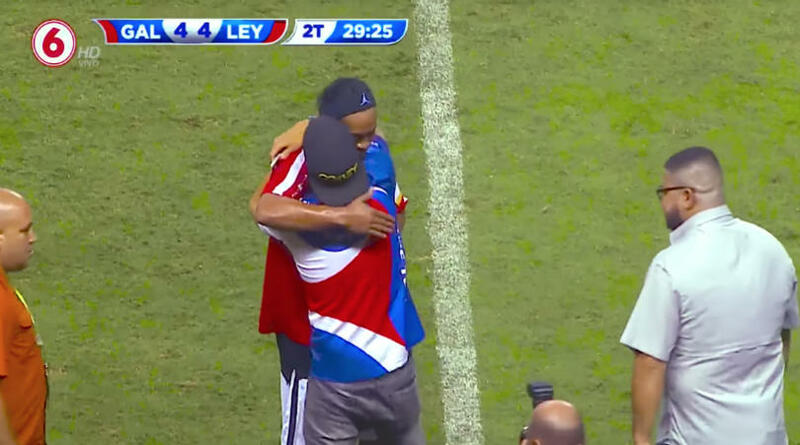 But Ronaldinho saw the commotion taking place and, upon realising what had happened, jogged over to give him a great big bear hug.